This PMR study offers detailed insights and in-depth research on the global non-medical biomimetic robots market between 2018 and 2028. This study highlights the non-medical biomimetic robot market potential over three intervals, i.e. short term (2019-2020), medium term (2023-24) and long term (2026-28). The non-medical biomimetic market is projected to register exponential growth over the forecast period. The study tries to cover various perspectives of the non-medical biomimetic robots market such as the evolution of non-medical biomimetic robots, market dynamics, value chain, pricing analysis, list of funding companies and organizations, competition analysis and a regional scenario overview. It also highlights various macro-economic factors at a regional level and for the top countries. The non-medical biomimetic robot market report also covers a comprehensive analysis by various end-use segments and applications. Increase in funding by government organizations for the research and development of robots for military applications is creating significant opportunities for non-medical biomimetic robots. The Persistence Market Research report on non-medical biomimetic robots carefully analyses the market at a global and regional level through market segmentation on the basis of key parameters such as end use industry and application. 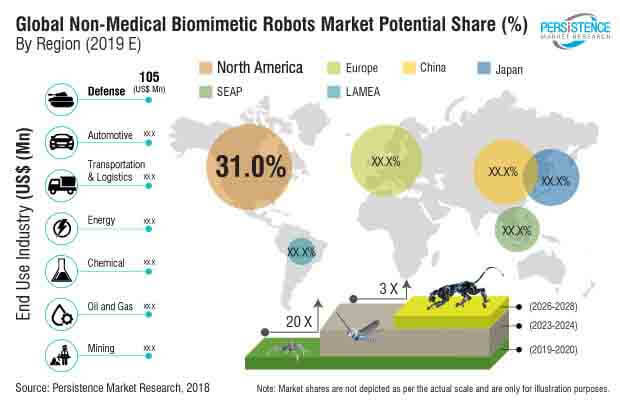 The primary objective of the report is to offer key insights on market updates, competition positioning, current trends, market potential, growth rates and other relevant information and statistics in a suitable manner to the readers or various stakeholders of the non-medical biomimetic robot market. The non-medical biomimetic robot market report has been formulated in a way that the reader can develop a thorough understanding about the market. It begins with market definitions, an overview of the overall biomimetic market potential, followed by the market background, market dynamics and market analysis by key segments, regional analysis and competition landscape. Each section covers a qualitative and quantitative assessment of the non-medical biomimetic robots market on the basis of facts, historical developments and key opinions collected from industry participants, researchers through dedicated interviews and trends in the market. The non-medical biomimetic robot report begins with a market introduction, defining the term biomimetic and the examples of common products and structures made from bio-inspired creatures. This section also covers market taxonomy and product definitions regarding the global non-medical biomimetic robots market. The next section of the non-medical biomimetic robot report highlights the overall global biomimetic market, technology roadmap, market analysis by end-use industries such as building and construction, transportation, automotive, energy and power generation, textile and materials and chemical, amongst others. The section also highlights the various products across each-use industries in research, prototype, trial and testing and commercialization. It includes a list of market participants that have launched their products inspired from a biological origin. The section of the non-medical biomimetic robot report that follows includes a comparative study of the conventionally-used and non-medical biomimetic robots, highlighting why non-medical biomimetic robots outperform in real time situations. The section also covers an overview of the overall robotics industry, primarily focusing on industrial and military robots. The next section of the non-medical biomimetic robot report covers a detailed description of the various prototypes of non-medical biomimetic robots developed so far, such as snake robot, fish, cheetah, humming bird, crawler, bat and ATLAS humanoid, among others. This section of the non-medical biomimetic robots market report is followed by market dynamics, which include various drivers and restraints that are projected to fuel or hamper the market growth. It also highlights the ongoing trends in the market and factors that might affect automation across regions. The next section of the non-medical biomimetic robots market report depicts the analysis of non-medical biomimetic robots by drawing analogy with other similar disruptive technologies such as cloud computing, artificial intelligence, cognitive computing, block chain, internet of things, cyber security and biometrics, among others. This section also highlights the commercialization stages of the each of these disruptive technologies across various end-use industries. This helps in drawing analogy and estimating the average time of commercialization and adoption rate of non-medical biomimetic robots across these industries. The following section highlights the non-medical biomimetic robots market potential in US$ (Mn). The section also provides an estimated market volume for non-medical biomimetic robots and a weighted average pricing analysis. The global numbers, i.e. market potential for non-medical biomimetic robots, have been derived from the individual regions, covering major countries by following a bottom-up approach. The non-medical biomimetic robots report also provides responses gathered from primary survey respondents, which have been taken into consideration while estimating the market potential. The last section of the non-medical biomimetic robot report is a competition landscape, which identifies the companies and research organizations that have been actively participating in the development of non-medical biomimetic robots. The non-medical biomimetic robot report covers the market structure and competition dashboard to provide an overall glimpse of the market. This section is primarily designed to provide clients with an objective and detailed comparative assessment of the key providers specific to a market segment in the value chain of the non-medical biomimetic robots. Examples of some of the key competitors covered in the non-medical biomimetic robot report includes Boston Dynamics, Festo Group, Agility Robotics, AeroVironment, Inc., The University of California, Massachusetts Institute of Technology, KUKA AG and ABB Group, among others. The last sections provide a step-by-step analysis of the methodology used to arrive at the market potential, keeping in mind the various macro-economic factors and dynamics of the non-medical biomimetic robots market.